As I write this, the year’s first real snowfall is blanketing the land. It’s a time of rest and introspection. Spiritually, it’s a new year. As with our secular New Year, it’s custom to reflect on various aspects of our lives, how we’ve changed, and where we’re going. Recently, I’ve found myself thinking a lot about my path and why I blog about it. Some of this came about through discussions with Lady Althea via Twitter, specifically about how motherhood has changed our paths, and how our spirituality should be more about doing than keeping up with appearances. Some of my thoughts came through an interview I did with my friend Corinne for her upcoming podcast – Who’s Your Mama? The focus of the podcast is on mothers and how they find a balance between their mamahood and various life passions. Corinne is interviewing friends from around the country first to get into the groove, as it were, and thought my story about finding time to further my Druidic pursuits and found a protogrove, all while raising a little one, was inspiring. I felt that I rambled a bit, but she said it was great! I’ll be sure that share that when it comes out in January. 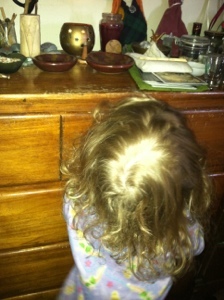 My little one joins me at my altar for a daily devotional. Photo by Grey Catsidhe, 2015. My religious practices haven’t changed much in the last year, but the way I engage with them has. The same time restricting forces that limit my blogging also limit the amount of time I have for involved ritual, magic, meditation, and trance. I’ve had to get creative in how I engage with my spirituality, and that’s only deepened my understanding of something I already knew to be true – magic and ritual is in everything. When we approach our daily tasks mindfully, aware of the interconnections, we are engaged with our spirit allies. I’ve also worked on my self-discipline. While accepting my limitations in time and energy at this point in time, I’ve managed to strike a balance. My trance studies are on hold for the time being, but I’ve worked hard to maintain the devotional practices I revitalized through ADF’s liturgical study program. I’m also working on my divination journal, focusing more on the practical work until I have a little extra time for the academic side of my Druidism. As a result, my understanding of the Druid Animal Oracle and ogham is improving. One area that I’ve improved on in the past year is my hearth or kitchen magic. I’m working on incorporating more holistic approaches to cleaning and health; and I’ve continued to make mostly home-cooked meals, often utilizing local ingredients. This has helped me grow in my herbal knowledge and connection to the land. Sharing these processes with my youngster, and showing her how to put love and intention into all we do, only strengthens my own focus. Including a toddler in seasonal and daily religious observances can be tricky, especially when they involve fire, but, in retrospect, I’m amazed at what I’ve been able to share with her. Bee is learning how to calm and focus her breathing. With my assistance, she uses a candle snuffer to assist in our symbolic smooring rite each evening. I explain to her what is a good task for her, and what is definitely a grownup job. She can snuff, but she cannot light the candle. These realities may be upsetting to her at first, but with repetition, she accepts them. This is teaching her respect for fire, that she has skills to grow into, and that there are times for quiet and action in ritual. Best of all, she’s learned to say “thank you” for abundance, inspiration, and beauty. It warms my heart when she reminds me that it’s time to do our “Brighid prayer” or when she randomly thanks the Earth Mother on our short walks outside. So while I sometimes feel that I’m not doing enough, or sharing enough – in reality, I have a lot to celebrate about the last year! I hope you take some time to reflect on your own practice and growth over the year. Although my divination method of choice remains “The Druid Animal Oracle,” I’ve been working to improve my understanding of ogham. Each day, after I perform my morning or afternoon devotional, I ask for an omen for the day and draw an ogham symbol from a muslin bag. I’m getting better at interpreting certain symbols and seeing how they could relate to my day, both as I head to known destinations and activities, and in reflection at the end of the day. Other symbols, however, continue to elude me. Part of this is due to the variety of interpretations in the books I have. Others seem very ominous, only for my day to be relatively stress-free. This left me confused and second-guessing the symbols. I wasn’t about to give up, though, as I know that questioning and critiquing are part of the learning process. Blackthorn has been one ogham symbol that has continued to bloggle me. Skip Ellison’s book Ogham: The Secret Language of the Druids summarizes its meaning as “Trouble & negativity” (125). Ian Corrigan also touched on Ogham in his work A Druid’s Companion: Lore & Rituals for the Work of Druidry. He summarizes its meaning as “trouble and protection.” Finally, Celtic Tree Mysteries: Secrets of the Ogham by Steve Blamires simplifies blackthorn as such: “Be prepared for a transition; prepare for something about to end; sudden change; death” (253). It’s quite the variety, but the common denominator is always fairly negative. Of course, most authors expand on the tree by looking at its folklore and biology. Blackthorn, however, continued to confuse me in part because of the symbolism associated with other trees. For example, some authors equate hawthorn with “unpleasant period(s)” (Blamires 253), or yew with death (Corrigan and Ellison). According to Cúchulainn, heather could also relate to death through his comparing it to the “shroud of the lifeless one,” (Ellison 47). Ultimately, one has to consider all the information as well as our own perceptions, but I was feeling overwhelmed. Perhaps part of this is my own inexperience with actual, living blackthorns? the other found blameworthy. These two are not of one mind. The one – so harsh – fosters evil war and the fray of battle. and divine will grant her a share of honor. planted her in the roots of the earth and among men. She is much better, and she stirs even the shiftless on to work. who hastens to his riches. This Strife is good for mortals. the beggar’s envy is a beggar, the singer’s a singer. This passage was a reminder not to lose sight of the less ominous interpretations of straif. They are also part of the blackthorn. Just as Hesiod says there are two kinds of strife, a positive and negative, blackthorn has its sides. It depends on the perception and context. The thorny bush could indeed be protective in certain circumstances. I don’t see death in it, though. I feel that yew, with its association with graveyards, has a better connection to death than blackthorn, but the latter surely relates to trouble and difficulties in reaching our goals due to all those thorns. Later that day, I further meditated on blackthorn while at yoga class. Before we started, our teacher set an intention for us. She asked us to think about transitions. As we went through our stretches, breathing, and movement, she would remind us to stop and think about the processes we go through to transition between one pose and another. Sometimes, those transitions were quite challenging. They sometimes made me feel a little clumsy or sore, yet they were part of an ongoing process. It dawned on me that the blackthorn I was drawing could relate to a transition I’ve been going through in my career. It’s certainly been stressful, but not dreadful. All the blackthorn could be related to the strife of hard work as I transitioned, and the difficulties of that process. This whole experience, while probably kind of roundabout, has felt like a breakthrough in my understanding of some of the ogham symbols. Let the journey continue! Slowly, slowly, I study and learn the ogham lore. It seems important, even necessary, for someone on the Druidic path to understand it. My go-to method of divination has been the Druid Animal Oracle. I love the rich symbolism and lore associated with the Nature Spirits. I don’t intend to stop working with that deck, but it feels wrong not to progress further with ogham. I need to practice more, and was thinking about how to go about that. 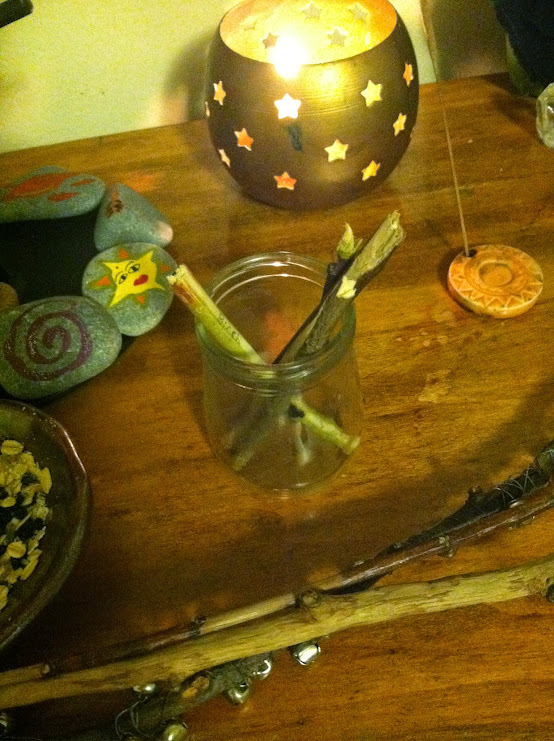 Tonight I purified and consecrated the ogham sticks. I fully intend to make a new pouch. That will add more of my own energy to the sticks, which is basically how I personalized my Druid Animal Oracle. Thus I delve deeper into my Druid path, further increasing my knowledge of lore and my intuition. A growing ogham collection. Photo by Grey Catsidhe, 2015. Slowly, slowly, my understanding of the ogham grows. As that flourishes, so does my collection of ogham wood. Since the summer, I’ve started to locate trees named in the ogham system, seek their fallen branches, made offerings to the trees, and learned more about them. Birch (beith) and ash (nion) came down during summer storms. Willow (sail) was found bellow a beautiful tree on the St. Lawrence River. Today we experienced a bit of a heat wave in Northern NY: 20 degrees F! Oooh baby! In all seriousness, it was truly a more comfortable day to get some fresh air. Gone was the biting, icy breath of An Cailleach. The softly falling snow insulated the land. While Bee enthusiastically chopped the snowbanks, I spied a small branch dangling from a nearby apple tree, hanging by just a thread of bark. I trudged through the high banks, asked the apple tree if I could have the branch, and it quickly separated. I felt that was a resounding “yes!” I didn’t have anything with me, so I promised future offerings and gave a song. When we left, Bee and I said “bye bye” to the apple tree. (I absolutely love how she talks to trees like her mama.) The thickest portion of the branch is now with the rest of my growing ogham collection, waiting to be sanded a bit and labeled – apple – ceirt. I’m undecided on whether or not I will utilize these tools for divination. Author and friend Skip Ellison of ADF advises on using uniform disks so as to avoid the possibility of memorizing the shape of different twigs and drawing what is desired rather than what is needed, even unconsciously. Others argue that the ogham symbols should truly be represented by the trees themselves, but that seems dismissive of their having been carved into stone, and their representing other things, such as animals and rivers, as well. Still studying and making up my own mind. 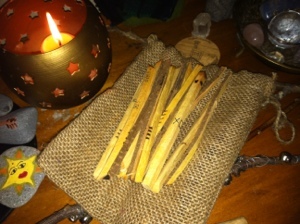 One thing is for certain – I’m planning to work with these ogham sticks for magic. Say I want to charge something for a specific purpose. I could sprinkle an object with sacred water using a specific ogham stick, place them in a bag together, etc. I could place an ogham stick under my pillow to help direct my dreams, or carry one in a pocket to help me with a situation. So many possibilities! My search for the ogham will continue. I already know where I will obtain oak, elder, and rowan. 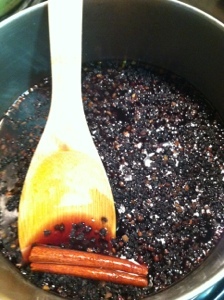 Others, such as mistletoe and blackthorn, will be a real challenge. As part of my devotional, I meditated. I started with a Two Powers, visualizing myself at my inner grove. I felt at peace, and enjoyed feeling the sun on my face. Eventually, images of myself making candles appeared. I’ve been feeling compelled to try that recently. My mind moved to something that has been bothering me recently – a few days ago my words failed me. It’s like my mind fell into a puddle for a moment, and the wrong words came out. I felt so stupid, especially as this was at a work meeting and I’m supposed to be well spoken in my field. Nobody said anything, but I stressed about it – and continue to. I hate the possibility that others might think I’m stupid, or might question my abilities. Mostly, I hate feeling that eloquence failed me. It’s as if I let Brighid down in some way, as she is a Goddess who favors the bards. I usually pray to her before rituals or public speaking situations, and usually, as my husband puts it, my tongue “drips with honey.” However, situations like this often overshadow any successes I may have experienced. I find myself wishing I didn’t stumble over my words, that I were wittier, that I were more intelligent. I guess I’m having a moment of inadequacy. During my meditation, as I dwelled on these worries, Brighid appeared to me. She reminded me that I’m still young, that people make mistakes, and that I need to learn from it but move on. She gave me a wooden disk with the ogham luis – rowan – on it. After I finished my meditation and devotional, I delved into information on luis to verify and add to my understanding of it. It’s association with fire and Brighid seem incredibly specific to the situation. I need to work more with that energy, and allow myself to shine as the symbol encourages. There is also the obvious protective element of rowan. Brighid has my back, and perhaps I shouldn’t allow myself to feel so vulnerable due to a little verbal misstep. Those things happen. I need to pick myself up, learn from my mistakes, and allow my inner flame to shine on! I’m asking my dear readers to indulge me in a brief, new agey digression. We all experience them from time to time, right? Astrology is one of those things that intrigues me but never holds my interest. It’s very involved. Many who dismiss it outright are only familiar with the Sunday newspaper variety. It wasn’t until my old friend Katrina did a workshop on making a natal chart that I realized how much work goes into it! Put aside any thoughts you have on the validity* and just look at what astrologers put themselves through! All their charts, longitude, latitude, angles, etc… Okay, my own ignorance is probably showing and badly. I’ve never been a mathematical person (despite what my rising sign seems to say), so astrology will probably always be one of those things I appreciate as a curiosity but never seriously practice myself. I acknowledge it and sometimes feel its influence – especially when things go retrograde. There is evidence that the ancient Druids knew about and even practiced astrology (Ellis). They were known for being talented and knowledgable with the ways of the stars and planets. (Here’s a short but interesting essay by Ellis about it:http://www.radical-astrology.com/irish/miscellany/ellis.html) Their astrology was certainly not the Celtic Tree Calendar that Robert Graves popularized in The White Goddess (Blamires). It really is amazing how many people still think that’s authentic… Anyway, I am very interested in learning about the Irish names for celestial bodies and perhaps gardening according to their movements. As a side note, I came across this website about creating zodiac gardens according to one’s sun sign. I was intrigued that two of my favorite trees, birch and oak, were associated with my sign as well as my spirit animal, deer. Deer makes sense considering Sagittarius’ association with horses and hoofed animals. I don’t know about the other correspondences… Might have something to do with fire and strength? At the moment, I’m slowly working on gardening according to the moon using the methodology suggested to me by local herbalist Sue-Ryn Burns. I enjoy it purely as a way to better connect with and experience the energies of the lunar cycle. Do you ever tinker with or think about astrology? Blamires, Steve. Celtic Tree Mysteries Secrets of the Ogham. Llewellyn, 1997. Ellis, Peter Berresford. A Brief History of The Druids. Carroll & Graf Publishers, 1994. * I once took a critical thinking class in college (philosophy 101). The professor made us pick from a list of topics, then research and write about why they are not logical. I’ve a healthy dose of skepticism, but the limited choices available were pretty insulting. I ended up choosing to “debunk” astrology purely so I could learn more about it!